A truly enticing new comic is announced every other week or so in today’s crowded sequential-art market, but it’s much rarer that we experience a day like today, when Marvel and DC Comics collectively dropped not one, not two, but three major reveals, all slated for December of this year (and all immediately shooting straight to the top of our most-anticipated lists). We couldn’t pick just one to gush over, so we’re highlighting the full trio with ample time for you to adequately prepare your pull lists. Starting with perhaps the most expected of the three, Marvel finally revealed today the new creators guiding Miles Morales, the teenage Spider-Man co-created by Brian Michael Bendis, who shepherded the character until signing an exclusive contract with competitor DC Comics late last year. Miles Morales: Spider-Man (blessedly not named Spy-D, as was once rumored) finds Eisner Award-winning Black Bolt writer Saladin Ahmed teaming up with “Young Gun” artist Javier Garron and cover artist Brian Stelfreeze, who drew Ta-Nehisi Coates’s initial Black Panther run. According to IGN’s exclusive reveal interview with Ahmed, Miles Morales will focus on the youthful Spider-Man as a community hero dealing with teenage problems, and will pit Miles against classic Spidey foe the Rhino in the opening arc. Also in December from Marvel Comics, mutant strike team X-Force returns from Extermination writer Ed Brisson and Cosmic Ghost Rider artist Dylan Burnett. While the title X-Force has graced a number of different series over the last decade, most modern incarnations treat the squad as a sort of black-ops spinoff of the X-Men, not the paramilitary rabble-rousers who became fan-favorites during the early ‘90s. Brisson and Burnett’s X-Force reunites original team favorites Domino, Shatterstar, Cannonball, Boom Boom and Warpath to deal with the shocking death of (spoiler alert) their former leader Cable at the hands of…a younger version of Cable. Comics, everybody! Deathlok, the time-traveling zombie cyborg who played a major role in Rick Remender’s Uncanny X-Force run, also features prominently on artist Pepe Larraz’ first cover. Not to be outdone by the House of Ideas, DC Comics surprised fans with the reveal of a brand-new Martian Manhunter 12-issue series from Batman/The Shadow collaborators Steve Orlando and Riley Rossmo. 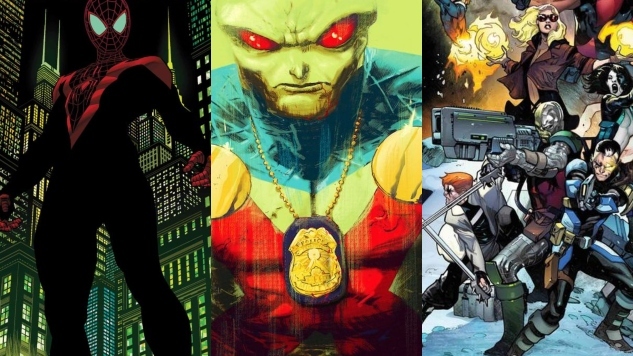 Positioned in the prestigious footsteps of DC’s current Mister Miracle maxi-series, Martian Manhunter will examine the longtime Justice League standby and supporting character in what Orlando is describing as his “dream project.” Over at The Hollywood Reporter, Orlando goes on to tease a deeper look at Martian culture than fans have previously seen, as well as a focus on J’onn J’onzz’ double life as John Jones, police detective. As with Miles Morales and X-Force, expect Martian Manhunter #1 to grace the shelves of your local comic shop or preferred digital retailer this December, and be sure to stay tuned to Paste for more details on each series as they develop.